It was great, very clean everything we needed. Looked alot more expensive that it was. Very spacious and light. Really great accommodation. Everything else, the showers we're lovely, could have stayed in them all day, the kitchen was great plenty of equipment to cook with all in good condition. The view from the balcony was imense, and the staff we're lovely, helpful, and welcoming. The location is perfect if you want to go out for food, or look and shop around Birmingham the bars and clubs were close but didn't stop you enjoying a night in apartment from noise. My mates and I were very impressed in general and have every intention of booking again next year, specially if we can have apartment 12-6 again. Beautiful apartment with nice view, very clean!!!! Everything was perfect!! We liked everything about it we stayed on 12th floor. Lock in a great price for SACO Birmingham – Brindleyplace – rated 9.1 by recent guests! 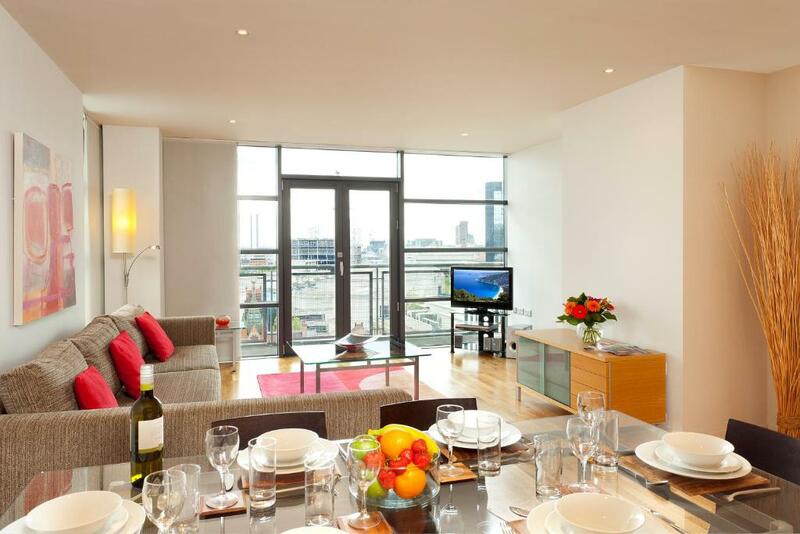 SACO Birmingham – Brindleyplace This rating is a reflection of how the property compares to the industry standard when it comes to price, facilities and services available. It's based on a self-evaluation by the property. Use this rating to help choose your stay! With excellent views out over the center of Birmingham, these modern Saco apartments have free Wi-Fi and a balcony or terrace. In the Brindleyplace, bars cafes and shops are just outside. 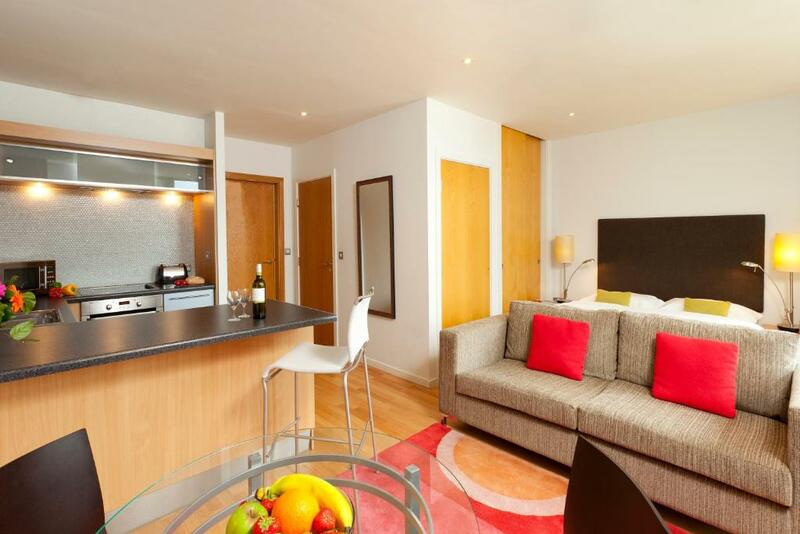 Each luxury serviced apartment at SACO @ Livingbase - Brindleyplace has a fully equipped kitchen featuring an oven and stove, microwave, teakettle and kitchenware. 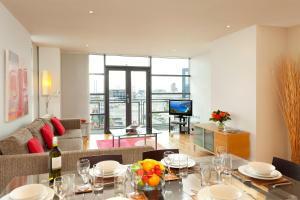 With access to a balcony, the spacious living/dining area includes a flat-screen satellite TV, DVD and CD player. It has sleek décor, hardwood floors and sofas. Each bedroom has a private bathroom. In the heart of the city's Convention Quarter, the International Conference Center is a 5-minute walk away. The National Sea life Center and National Indoor Arena are a 5 minute walk away, and Birmingham New Street Train Station is a 15-minute walk away. 뀐 Located in the real heart of Birmingham, this property has an excellent location score of 9.3! 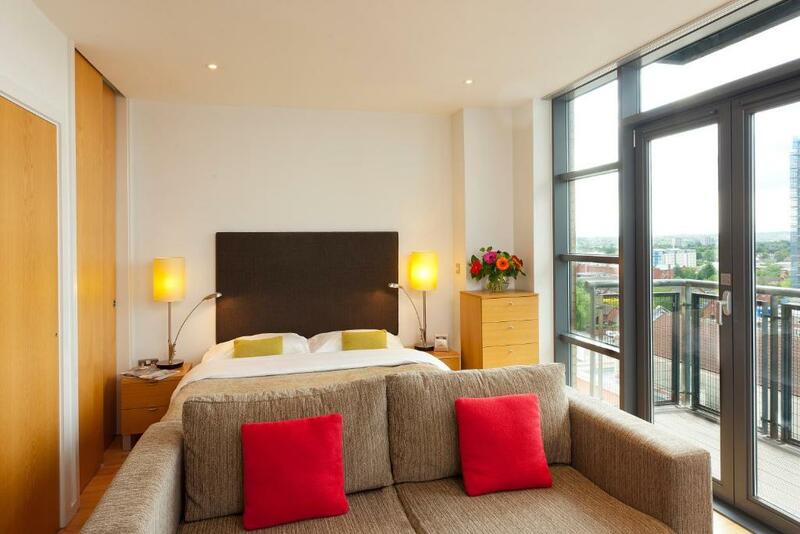 When would you like to stay at SACO Birmingham – Brindleyplace? This 1 bed apartment features a fully equipped kitchen, a separate double bedroom and a bathroom with a bath and overhead shower. 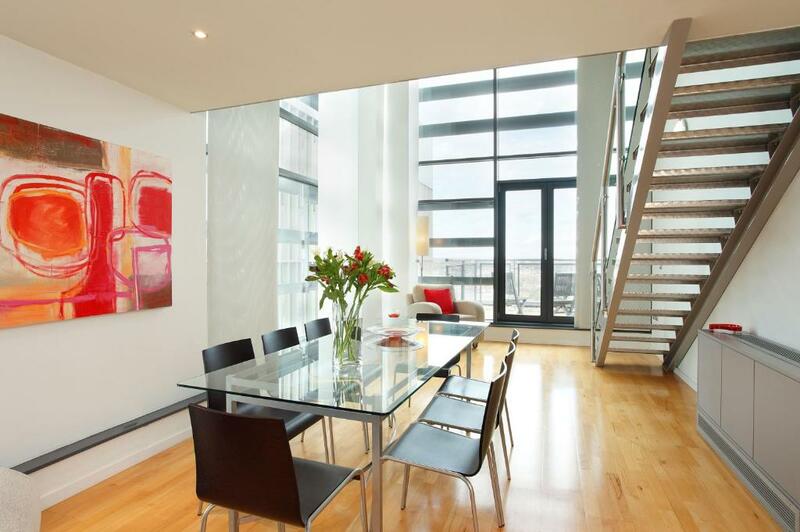 The spacious open plan living/dining area has access to a terrace or a balcony. 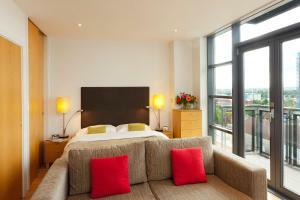 Guests have access to a small balcony featuring views of Birmingham. This superior two-bedroom apartment features a living area with flat-screen TV, satellite channels and DVD player and an open plan, fully equipped kitchen and 2 bathrooms with free toiletries including 1 private bathroom. These apartments contain a standard double bedroom and a second bedroom with 2 double beds. The 2 bathrooms are bright and modern, 1 is an en-suite and 1 has a bath and an overhead shower. 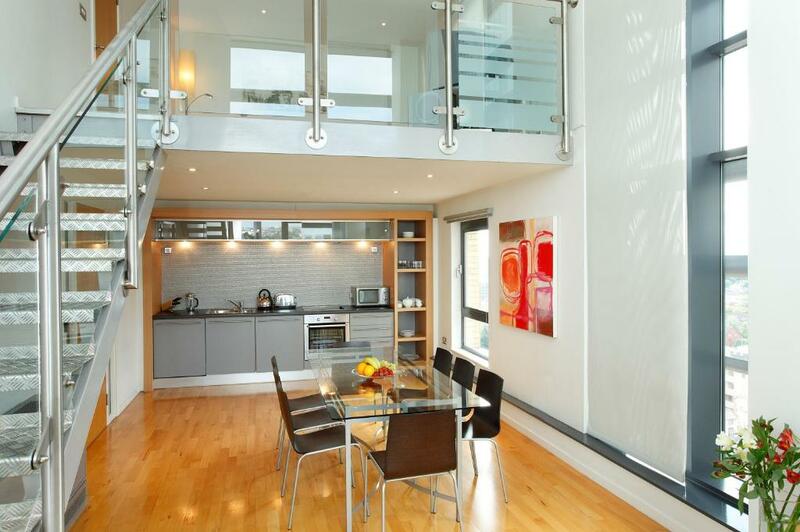 The open plan living/dining area has access to a large balcony. This two-bedroom apartment features a fully equipped kitchen and 2 double rooms including one with en suite. Guests have access to a small balcony offering unique views across Birmingham. This one-bedroom apartment features an open-plan living area, a fitted kitchen, and a bathroom. The bedroom can be set up either as a double or twin, please indicate your bedding preferences at the time of booking using the special request box. The modern bathroom contains a bath with overhead shower and the open plan living/dining area has access to a balcony that features unique city views. This two-bedroom apartment features an open plan living area, a fully equipped kitchen. One bedroom has an private bathroom and there is an additional bathroom in the suite. The second bedroom can be set up as a twin, please indicate your bedding preferences at the time of booking using the Special Request Box. The bathroom contains a bath with overhead shower. 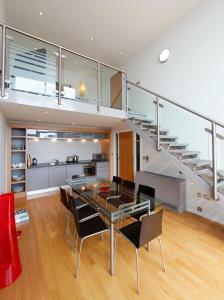 The open plan living/dining area features access to a small balcony with unique city views. These club apartments, built across 2 levels, feature 1 double bedroom with an private bathroom and a second bedroom with 2 double beds. The living area features floor-to-ceiling windows and a terrace with spectacular views across the city. 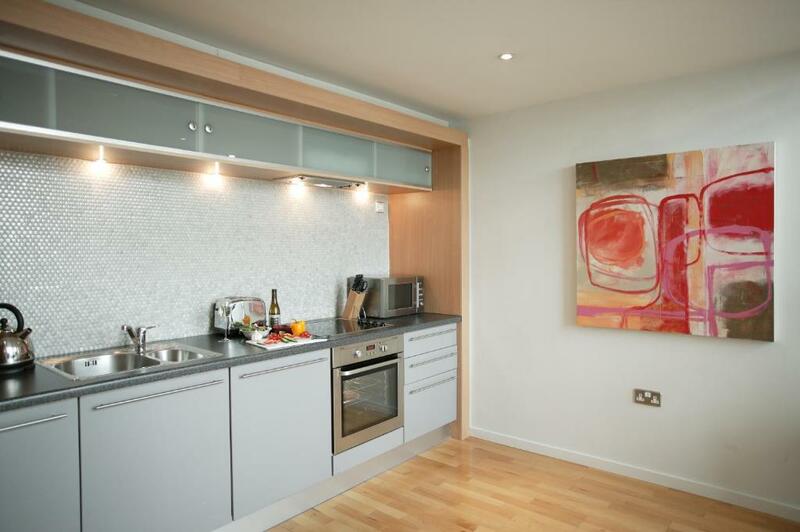 The open plan, fully furnished kitchen has a bumper breakfast pack. Enjoy the city views from the floor-to-ceiling windows in this spacious mezzanine apartment. With a fully equipped kitchen, a modern bathroom and a balcony, this suite also includes SKY TV package, faster WiFi and a bumper breakfast pack. 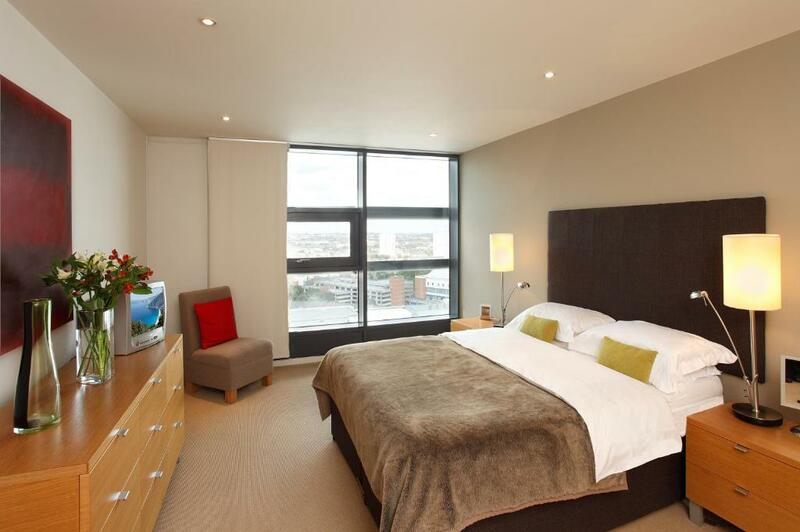 The bedroom and the spacious living area feature city views. We have over 20,000 serviced apartments in more than 42 countries worldwide. House Rules SACO Birmingham – Brindleyplace takes special requests – add in the next step! All children under 12 years are charged GBP 22 per night for extra beds. SACO Birmingham – Brindleyplace accepts these cards and reserves the right to temporarily hold an amount prior to arrival. Please note a pre-authorization of GBP 1 is required in order to check-in to your apartment. Assuming you do not incur any additional costs during your stay the pre-authorization sum will be released automatically. In the event that additional costs are incurred, you will be contacted by the Apartment Manager who will confirm the amount you have been charged and the reasoning behind this. Please note that cash is not accepted to settle your pre-authorization. Group Policy: A group booking is considered to be 3 apartments or more being booked in the same city for similar dates. When making a group booking, full payment will be required at the time of booking and this is nonrefundable. A security deposit, as above, will also be required for each apartment booked. Unfortunately the property cannot guarantee that all apartments booked will be in the same building. Please note that guests are responsible for their visitors. Nonresidents will not be allowed access to the apartments after 23:00 and there is a strict no party policy. A security deposit between GBP 500 and GBP 1000 is required upon arrival for incidentals. This deposit is fully refundable upon check-out and subject to a damage inspection of the accommodations. Provided with breakfast and drinks. A lot of young groups, we were kept up half the night with noise from next door. The apt description stated a “large” double bed. I expected a super king size but was disappointed to find it was only king size. Wi-fi in the apt didn’t work. After 15-20 mins of messing around they finally accepted this and connected us to the wi-fi in the apt next door. Apt description stated a large balcony suitable for outside dining, it was actually barely large enough for 2 adults to stand on. Having to produce photo ID when checking in is ridiculous, particularly when advance payment has already been made through booking.com! It’s very strange, no where else I stay insists on photo ID. Parking - when booking it says to ask them for the “exclusive discount code”. It would be more honest and transparent if they just stated the multi story is £19 but their guests get it at £13.50. There’s no DVD or CD player or even a radio. Tea, coffee, milk and bottled water were provided. The rules are too strict that makes it not an enjoyable stay. Needa sign in and out for visitor like a boarding school!? The advertising brochure illustrated more room than in reality. The dining area was very cramped. The seetee was in the vision of the television whilst in bed. The main light switches are located at the main door not near the bed sleeping area. The welcome of the reception staff. Difficult to find in first occasion. Blinds were not working properly. Great location and nice bright corner apartment. Needs a mirror near a plug socket, no mirrors in the bedroom, bathroom or hallway that you can dry or style your hair with. Clean spacious apartments. The kind girls on reception upgraded our room to a top floor apartment as I had previously stayed there as a group of 20 for my sisters hen do. Very kind gesture to allocate me the exact same room.